I seldom write fan letters to other authors. Not that I don’t want to; there are lots of wonderful books that move me to admiration, laughter, tears, etc., and I’d love to let the authors of them know that. In some cases, the authors in question are dead, though, which kind of renders a fan letter moot (though I do Say a Word during my evening rosary—that’s my Lenten devotion this year, saying the rosary every night (provided I don’t fall asleep in the middle, but I haven’t yet; lovely, peaceful meditation)). In most cases, though, I just don’t get around to it. You know, busy life, obligations, family, dogs, book-tours, saying the rosary [g], answering the nice messages people send me, etc., etc. I’ve just finished wallowing in PANDAEMONIUM, pausing occasionally to gasp with admiration at your sheer technical brilliance (we’ll take the tremendous energy, amazing ear for dialogue and eye for social dynamics, and your talent for chronic hilarity (ranging from subtle to belly-laugh) as read). All of which is _nothing_ to my enjoyment of the way your mind works. [g] I couldn’t have done a clearer explanation of just what science _is_ (and how it works) myself–and I do it frequently, what with the appalling state of prevalent ignorance and the many practitioners thereof. And the sheer bloody brilliance, not only of the concept, but the _ending_…! I’ve been enjoying your books for years, and you’ve been getting better and better, juggling the ideas so deftly with the satire and the plot (speaking of juggling, I adore your magician from THE SACRED ART OF STEALING and SNOWBALL IN HELL, too). This one is Just Great. Thanks so much. So anyway, still in the grip of this unaccustomed burst of energy [g], I thought I’d mention Chris as the latest recommendation on The Methadone List, and an excellent one he is, too—not only for the quality of his books, but the quantity as well; he produces something close to a book a year (a feat which excites my envious admiration). Brookmyre’s books are all violent, bloody, and absolutely hilarious. They’re not a series; some of the books feature a recurring main character, the journalist Jack Parlabane, two of them have a wonderful, emotionally vulnerable, light-fingered magician as the hero (I fell in love with him, and I have high standards in that department [cough]), and some are one-off standalones. ALL of them are wonderfully plotted, deeply satirical, and done with a distinctly Scottish sense of humor. http://www.poisonedpen.com/search?SearchableText=Christopher+Brookmyre .) I’m sure you could get them all from amazon.co.uk, but then there’s the shipping to pay, so it’s pretty much a wash.
Hope you enjoy him as much as I have! I have never read anything by Brookmyre and seeing your glowing endorsement had a look. His style reminds me of Terry Pratchett. Wordsmithing of the sort that can be read almost without any thought to overall plot, but instead sentence by sentence as an indulgence in language applied with artistic brilliance. The reviews seem to be pretty mixed – the impression I am getting is that he changed genres with this book, going from crime fiction to crime sci-fi. Would you recommend this book as the best intro to this author? Looks like I have a few more to add to the TBR pile-er, I mean, mountain. I really wouldn't call it a change of genre; all his books have elements of crime/mystery to them, and so does this one. It just also involves demons [g] (there's more about that, but I can't say without giving away an Really Important plot twist.) His THE ATTACK OF THE UNSINKABLE RUBBER DUCKS has a semi-supernatural (or not [g]) angle to it, as well–but is one of the Jack Parlabane books. One of the reasons, I think, that I like his books so much is that they remind me of my own, in terms of genre confusion. You _could_ call what I write all kinds of things (and people _do_), including fantasy, science fiction, romance, etc.–but every one of my books also includes a murder mystery; it's just not the main focus of any of them. The other main reason (aside from those noted above) is that–being a writer–I can see just how cleverly his books are put together, from a technical angle. From that angle, PANDAEMONIUM is definitely his best–but they're all good. Diana, I had not considered this before, but I suppose yes, you do put in the murder mysteries. Hmm… guess I'll keep my fingers crossed that William isn't at the centre of the next one. It is the accurate reflection of the irrationality of the human though process that really intrigues me. The way a person may think about a the end of the world one moment and breakfast two seconds later. Many writers simply do not include that. When I think about it, I probably judge books more on the strength of their dialogue sequences and the refection of human thought then anything else. 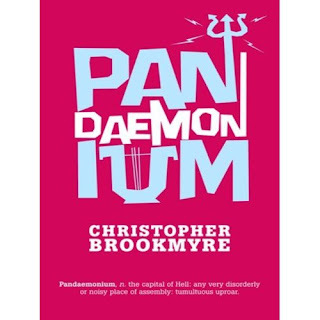 But, back to Brookmyre… given your admiration for the genre confusion in PANDAEMONIUM, can we assume that your full-length crime novel won't exactly stick to one genre either? Ooh great! Just in time. I was needing some good reading. I've read all of his books, but Pandaemonium is still on my TBR rack. I found his books a revelation! My favorite one is A Tale Etched in Blood and Hard Black Pencil. The way he lent a voice to these school children! Incredibly good. Oh yay, I'm always looking for great new authors, I can't wait to give him a try! Somehow, I can't see American publishers being bothered by that. [g] Much more likely, the use of Scots (Glaswegian) idiom and cultural references; remember, these are the people who renamed HARRY POTTER AND THE PHILOSOPHER'S STONE (and carefully "translated" all the British references), because they thought the American public wouldn't understand what a philosopher's stone was and would be too dumb to figure out the references in context. I discovered Christopher Brookmyre last year when I read The Sacred Art of Stealing and was immediately seduced by his humour, plot twists and wonderful Glaswegian dialogue. Somehow I was sure you'd be a fan [g]. I am slowly working my way through his back catalogue but may have to make Pandaemonium first on my list. Just wondering, while we're on the subject of methadone authors [g], whether you've read any of Neal Stephenson's works? I'm thrilled to get a recommendation from an author that I suspect doesn't dole them out too lightly (that's you, DG). I'm such a voracious reader (see http://www.anamericantable.com/2010/02/outlandish-day.html ) and can't wait to add a new author to the mix in the wake of having finished the Outlander series. I have a great library nearby (I know this doesn't help with bestseller lists, but I can't afford my habit) and love someone whose talent breaks past barriers. I wonder if it's a good idea to tackle his earlier stuff first and work your way through. Thanks for the recommendation! I also can't wait to check out the methadone list. Yay! Thank you for the recommendation – always looking for books! I will be sure to try him out. Do you have a suggestion for which one I should read first? As for the harder to find books – my mother got me hooked on alibris.com – have you ever used it? They have everything from inexpensive used paperbacks to autographed first editions – I love the site – and have yet to be disappointed by them not having something available. Yes, I patronize alibris and abebooks all the time. [g] _And_ Kindle editions! Personally, I like to read an author's stuff in order, just to see how they evolve in terms of their writing, but it's not necessary here in terms of the stories. What do you partcularly like about him? Thanks so much for the recommendation. When I met you in Auckland NZ you recommended Mike Carey & Phil Rickman. I have thoroughly enjoyed both writers. I have the Gomer Parry Plant Hire t-shirt to prove it! [g] (Did you know they've put out a Lol Robinson CD too? It's quite good). The library has lots of Brookmyre, so I'm heading there to get a taste of his writing. One of the things that I particularly like about Neal Stephenson is that his books share some of the qualities of yours [g]. In fact, if I could only ever read one author's works for the rest of my life I would choose either your Outlander series, Neal Stephenson's Baroque Trilogy or Dorothy Dunnett's Lymond Chronicles. Although all written in quite different styles those three wonderful sagas all share certain characteristics, not the least being that they are all BIG BOOKS [vbg]. But apart from sheer gargantuism, they are all stories of many layers and texture that can be read and re-read without ever feeling like you've taken everything in. They all cross many genres, including history, mystery, adventure, romance and a touch of the supernatural. They all make me laugh out loud in places. They all involve real historical events and people entwined and threaded with fictional ones. Neal Stephenson also has a lot of science in his book (I think it was your comments to Christopher Brookmyre about science that took me off on this tangent [g]). The book Quicksilver that you have is the first book in Stephenson's Baroque Trilogy which is set during the Enlightenment. Isaac Newton, Gottfried Leibniz and Benjamin Franklin all feature prominently. If you were wanting to get a taste of Stephenson's writing this may not be the best place to start as the books in this trilogy are not quick reads [g]. I would recommend his novel Cryptonomicon. It is much shorter but also mixes history, fiction and science to tell the story of the development of cryptanalysis, computers and digital information. Also, many of the characters in Cryptonomicon are descendants of characters in The Baroque Trilogy which will give you an added insight into those books should you decide to go on and read them. Neal Stephenson also has a character who suffers from the same sort of time displacement as Master Raymond [g]. I better end before this turns into a Big Book itself! Thanks for letting me ramble. That's kind of what I was thinking – I love seeing how an author evolves over time. If you trust an artist to take you on the journey, it's nice to see the kind of ebb and flow of their writing. And, as much as I love reading an author (more or less) chronologically, I'd also like to add that no one's story evolves like Jamie and Claire's or DG's writing :-)!